Friends finder app is help you for find friends usernames, girls usernames, follower & views for snapchat. Q:- Are you single? Are you find snapchat friends nearby country for snapchat ? A:- This Friends usernames finder App is Best for you to find someone for you. Get free followers & add new friends. Easy way to become popular & increase snap views for snapchat Is Add your username in App And Get More views & friends. Now you Can Get More & More friends list, buddies & Girls usernames. Make new friends & Get snap girls for snapchat by Country, Gender & Age. 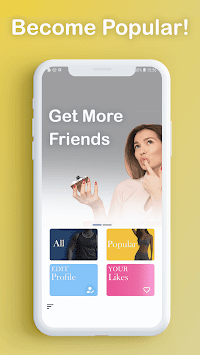 You can get friends usernames, add friends, find friends in your area by country, girls usernames, Increase follower for free using this app.